Sweet and sassy or predatory and hardened, sexualized girlhood influences our daughters from infancy onward, telling them that how a girl looks matters more than who she is. Somewhere between the exhilarating rise of Girl Power in the 1990s and today, the pursuit of physical perfection has been recast as the source of female empowerment. And commercialization has spread the message faster and farther, reaching girls at ever-younger ages. But how dangerous is pink and pretty, anyway? Being a princess is just make-believe; eventually they grow out of it . . . or do they? In search of answers, Peggy Orenstein visited Disneyland, trolled American Girl Place, and met parents of beauty-pageant preschoolers tricked out like Vegas showgirls. The stakes turn out to be higher than she ever imagined. From premature sexualization to the risk of depression to rising rates of narcissism, the potential negative impact of this new girlie-girl culture is undeniable—yet armed with awareness and recognition, parents can effectively counterbalance its influence in their daughters’ lives. 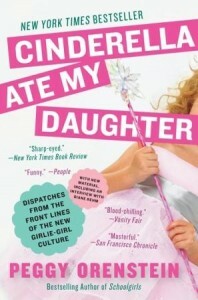 Peggy Orenstein is the author of the New York Times bestseller Waiting for Daisy: A Tale of Two Continents, Three Religions, Five Infertility Doctors, an Oscar, an Atomic Bomb, a Romantic Night, and One Woman’s Quest to Become a Mother and Schoolgirls: Young Women, Self-Esteem, and the Confidence Gap. A contributing writer to the New York Times Magazine, she has been published in, among others, USA Today;Vogue; Parenting; O, The Oprah Magazine; Salon; and The New Yorker. Orenstein lives in Northern California with her husband and their daughter, Daisy. Wednesday, February 8th: Book Club Classics! Monday, February 20th: Life is Short. Read Fast.